Situated as it is, at the crossroads of sea communications between Europe, North Africa and the Middle East, the island of Crete has always been a tempting fruit, ripe for picking by invaders, colonisers and traders. Some have coveted the island for its natural riches of timber and fertile agricultural land; some have wanted to use it as a buffer between themselves and aggressors, others as a base for attacking enemies or as a departure point for invasions. Crete’s history is one of invasion, resistance, battle and bloodshed, interspersed with periods of calm and prosperity under a succession of rulers. At times the island had seen such prosperity that it has been known as the jewel of the Mediterranean. At other times it has sunk into the misery of neglect and cruelty so deep that it seemed that it would never rise again. Each succeeding culture, beneficial or destructive, has left its mark. There are relics and remains of every period in the town streets and on lonely hillsides, among which the present-day Cretans lead their lives unconcernedly . The great Minoan civilization that rose and fell in Crete between 2600- 1400 BC left palaces at Knossos, Phaistos ,Malia and Zakros. Another is the hilltop town of Gournia, all of which are magnets for hundreds of thousands of visitors. After the Minoans, the Dorians who then ruled Crete built small city- states such as Polirrinia and Itanos, in the hills and by the shore, and their house and temple ruins lie mostly unvisited. The enormous sprawling Roman city at Gortys , where the olive groves are strewn with marble columns and fragments of pottery. Gortys also has a large basilica, built by the Byzantines ,the next rulers of Crete. Byzantine artists decorated their churches with geometric frescoes which display thousand-year-old colours that are still bright today. 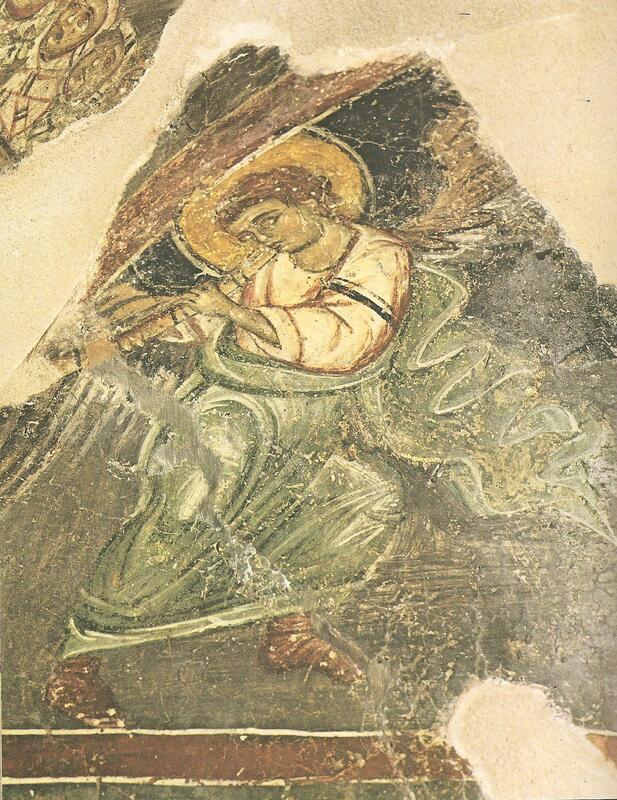 Byzantine fresco. 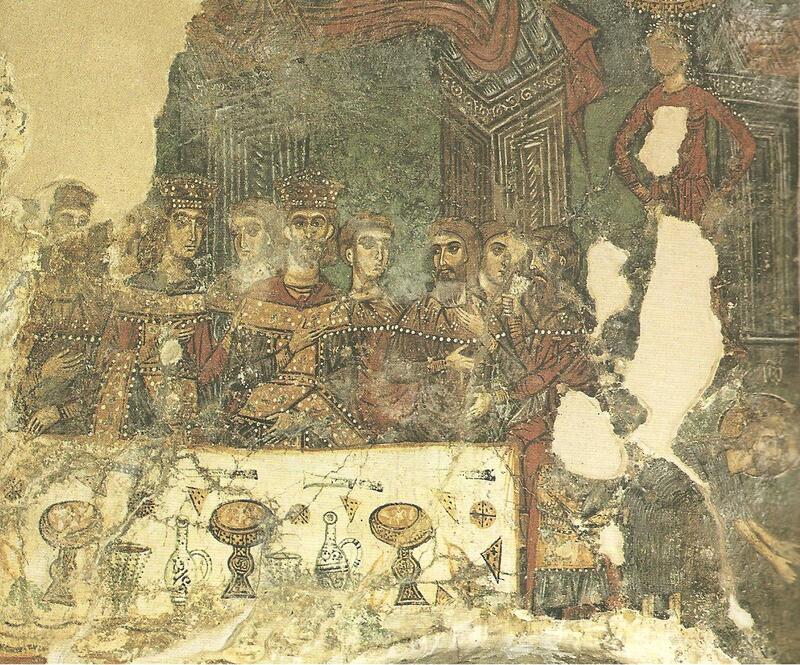 Herod ‘s Banquet. at the church Panagia Kera Crete. Panagia Kera Byzantine Church. The Last Trumpet Call Fresco. From 1204 for 450 years the Venetians held the island and their magnificent solid architecture is still widespread. The Turks drove the Venetians out in 1669, and ruled until 1898. They built fountains and minarets and added their own style of doors, windows and arches.to the Venetian houses. War memorials, newly built mountain villages and recent rebuilding in the bigger towns are reminders of the extensive damage suffered during World War 11 . 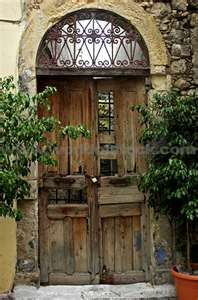 There is a mixture of Venetian and Turkish architecture in Rethymno Crete. Crete rests largely on the remains of an obscure Bronze Age civilization unearthed by a short sighted Englishman. When Sir Arthur Evans discovered and excavated the palace at Knossos in 1900 he brought to light one of history’s most fabulous treasures, forgotten under the earth for 2,000 years and more. Evans named the palace builders Minoans after the mythical King Minos of Crete for this discovery brought together mythology and history, legend and fact. Other excavations at Phaistos , Malia and Gournia were to confirm what Evans suspected- that the ancient legends of Crete were founded on reality. Folk memories existed of a sophisticated, creative, artistic and powerful society that had once flourished on the island. The early excavations were not the end of the story. As late as 1962 the splendid Minoan palace of Zakros was unearthed and more discovery’s were made in caves and on hilltops all over Crete. Libation jugs, votive figurines, statues, pots and gold ornaments are among the treasures brought up to the surface. Hundreds of Minoan houses, store rooms, streets and sanctuaries lie concealed, some known to archaeologists, others yet to be discovered. The Minoan civilization’s architecture demonstrates that they were both advanced and highly sophisticated. The Palace in Knossos, Akrotiri, and Zominthos contain architectural feats that are near unparalleled for their time. These feats include plumbing, drainage, use of light reflection and air. 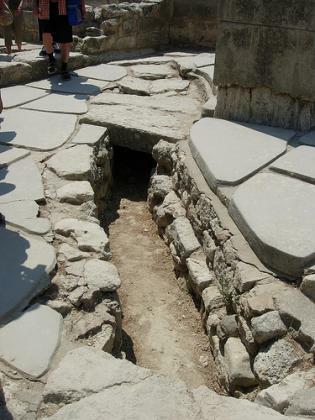 The Palace of Knossos had an extensive water supply and drainage system throughout the structure. They used terracotta pipes to deliver water to the palace as well as a subterranean drainage system that ran beneath the palace to prevent flooding and to dispose of water. The town of Akrotiri had the capability to run fresh water into every building, and also had a sewage system throughout the entire town connecting to bathrooms within the buildings, even connecting to the second floors. The toilets of the town had an ingenious design; the waste would fall down a clay pipe to the subterranean sewage system below where water from the town’s drains flushed it into a cesspit. The pipes were designed in such a way that a siphon effect drew the smells down the pipes away from the lavatory. This type of system was at least a thousand years ahead of its time. 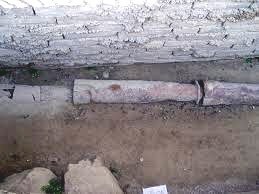 A portion of the Minoan terracotta pipe system that was able to pump water – without mechanized pumps using the (Venturi effect) uphill, to bathrooms, kitchens and fountains. Channels at the flat surfaces contained catchment basins to control the water velocity. Probably the upper system was open manholes which provided access to parts that were covered. 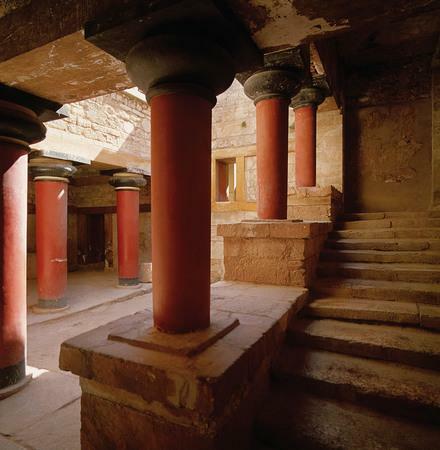 Within the structure at Knossos the Minoans used their central staircase to provide light to the inner rooms of the palace. 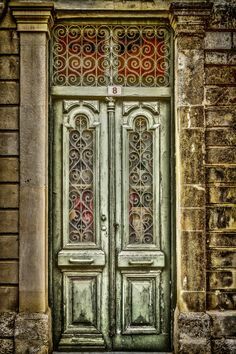 They also used a system known as peer and door partitioning (rows of pillars holding wooden shutters which could be opened and closed) to control air flow within the inner rooms. They also had under floor heating . Knossos.Palace. The stairway to the main living quarters. It was after making surprising studies related to ancient Greece Heinrich Schliemann attempted a dig at Mycenae in August 1876. The nature of the discoveries at Mycenae were so dramatic that Mycenaean became the name for the whole culture that spread across Greece. Although Schliemann discovered no writing his student Arthur Evans did. On Crete he found tablets with two types of cryptic scripts which he named Linear A and Linear B. Later Linear B. tablets were found on the mainland associated with the Mycenaean culture. In 1952 Michael Ventris identified a decipherment of Linear B as an old form of Greek and new information became available about the nature of the Mycenaean culture. One reason that Linear B was able to be deciphered is that the language of the Mycenaean ‘s was an early form of Greek, while the language of the Minoans does not seem to have been Greek. 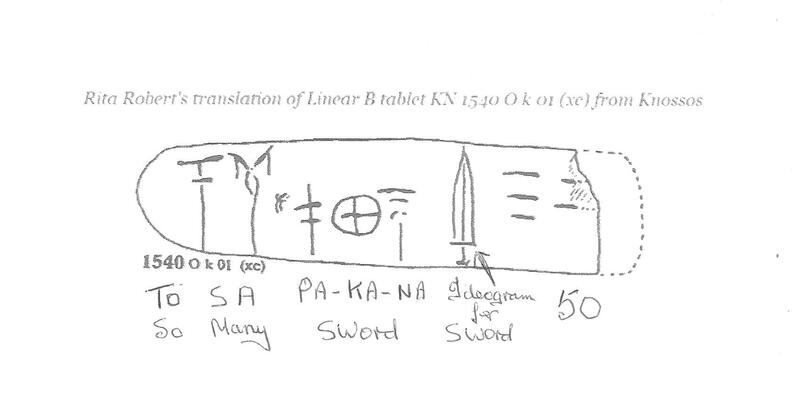 When the Mycenaean culture collapsed around 1000 BCE the ability to write Linear B was lost. Later a new form of writing based on the Phoenician alphabet was then developed which included the feature of vowels which had already previously made its appearance in both the undeciphered Minoan Linear A script and Mycenaean Linear B. This new alphabet probably was developed by Greek merchants who needed to record transactions.. But its usefulness quickly spread. Many early Greeks may have learned to write so that they could read and cast curses, and send written prayers to divinities. By 800 BCE the myths had been recorded in the various emerging dialects of the new script.The myths were based on the Mycenaean past but they had been preserved by itinerant story tellers who memorized the stories of their predecessors. It was common for them to use contemporary examples to make their stories more realistic. Thus the myths contain information about ancient Greece in the Mycenaean period, predating the myths themselves b y some 400 to 700 years (1200 to 1500 BCE) . Examples can be found in the works of Homer. Using Homer it is easy to identify the Mycenaeans with the Achaeans whom he refers to. In Homer’s IIiad Book 2, line 494 and following there is a catalog of ships, which lists the various communities which provided them. Mycenae is one of these , and the other places Homer mentions correspond closely to the findings of Mycenaean ruins. Until its conquest by the Mycenaean’s the Minoan culture was dominant and many aspects of the Minoan culture were probably adopted by the Mycenaean’s This includes many place names (toponyms), personal names ( eponyms) agricultural records of livestock and crops,military matters crafts, textiles and even religion. The Greek language which was in a formative period when the Mycenaean’s conquered the Minoans was spread throughout the Greek area. While the Minoans did not seem interested in military lifestyles the Mycenaean’s were most interested in weapons and hunting. The Minoans focused on the sea while the Mycenaean’s possessed a small horse, called a poro = a foal which they rode on land. The Minoans developed a high culture which centred on their palaces, while the Mycenaean’s seem to have borrowed most of their culture from Crete. Like the Minoans the Mycenaean’s also developed palace culture. 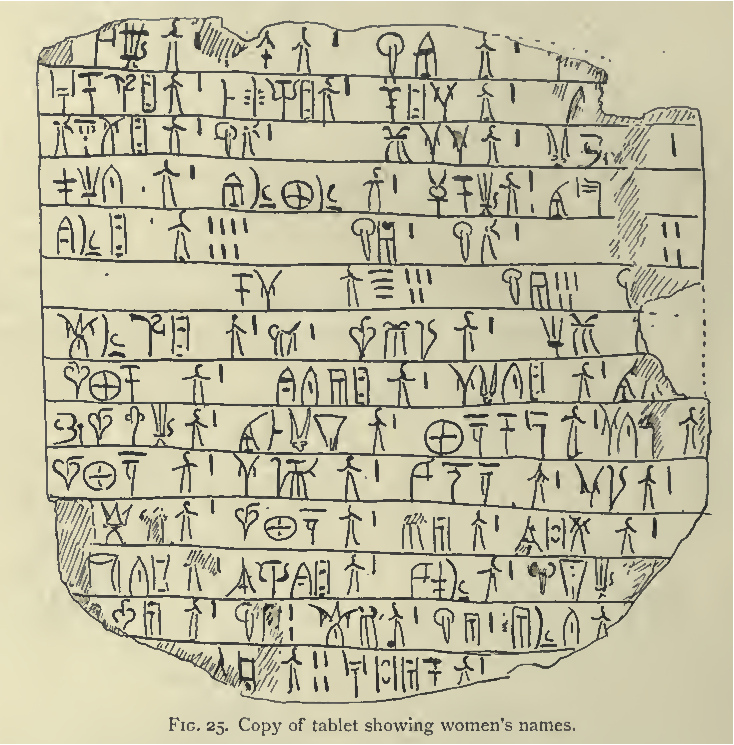 The study of Linear B handwriting has been extremely helpful to the task of distributing the tablets into their correct files. Just as modern handwriting differs so too Mycenaean scribes had characteristic hands; the way in which they make some of the common elements of signs allows us to clarify them. For instance, an inverted V forms the basis of several signs, and scribes can be grouped according to whether the sides of the V are straight or convex. Careful examination of the ridges formed by the way various scribes pressed the stylus in the clay reveals that we can tell the order in which intersecting strokes are written. The cross element, which recurs in a number of signs (e.g. KA6. ) may be made with the vertical stroke crossing the horizontal stroke or vice versa, or the strokes may even be curved. Equally significant at this level are the way adjacent strokes are spaced, joined or left un-joined, the position and shape of minor elements., the doubling of lines. 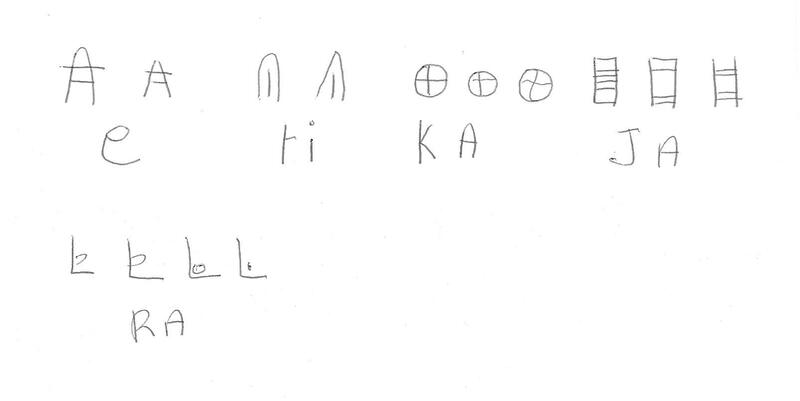 Using this approach, Bennett (l958) and Olivier (1967) were able to identify securely the personal handwriting of a large number of the more prolific scribes at Knossos and Pylos. As a rule, all of the tablets were written by the same scribe in a single file though exceptions occur; and there are cases where two scribes have written on the same tablet, as if the appropriate clerks have each been ordered to add their own quota of information, ( Cf.Pylos tablet PY Ed 411). The number of different hands at each site is quite large, probably as many as 70 at Knossos, at least 40 at Pylos. This means that the scribes are literate officials who can write a tablet as and when required ,but also have other duties to attend to. Some senior officials seem rarely to have written a tablet themselves, no doubt leaving their subordinates to do most of the work, but occasionally they take the stylus in their own hands. While the total number of documents at each site reveals a very small average production per scribe, in fact some scribes are prolific where others do very little, it is likely that most of them had other duties than writing, since one scribe could easily have written all the surviving documents from either Pylos or Knossos in a few weeks. No doubt moments of boredom would set in for these scribes, just as in modern offices of today. At such moments, a Mycenaean clerk would turn his tablet over and perhaps draw a sketch or pattern. We are lucky to have one among several examples of this kind of, shall we say doodling. Others of course must have ended up in the scrap basket. 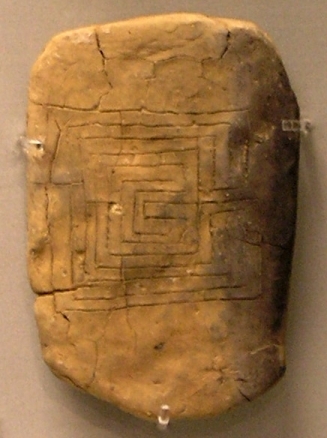 A scribes doodle of the Labyrinth on Clay tablet. If each official was in charge of a particular department, then bringing together all the tablets he wrote may allow us to see what his particular responsibility was. At Pylos for instance, there was an official who seems to have written nothing but the tablets dealing with chariot wheels (Sa ) and a label (Wa 1148) The label may not have otherwise been associated with this group, but the handwriting itself shows that it belongs here. At Knossos we again find the same official dealing with wool, cloth and women workers; he was obviously concerned with the organization of the textile industry. This is a very interesting tablet which I have almost finished translating. It contains information, as you can see, of woman’s names, some of whom were slaves working at Knossos. I shall publish it on my blog when I have completed its translation. There are however problems caused by scribal errors. Mycenaean writers were no more reliable than we are, and were quite capable of leaving out a sign by accident, writing the wrong sign, or spelling the same name two different ways,making translations difficult to decipher, as I myself have discovered. However these errors could hardly have caused much trouble to the people who were intended to read these documents in Mycenaean times. Sometimes a repeated formula is slightly varied; so how can we be sure if this was without significance or was intended to convey a different meaning ? Linguists were puzzled for a long time by a form( wo- zo- e ) until another tablet was found bearing the same formula, which showed that the mysterious word was an error and should have been wo- z – e ( To work). If the parallel text had not turned up , we might still be racking our brains to explain the erroneous form; so at least some of the words that still defeat us may be due to errors for which corrections may yet be discovered. It often happened that the scribe. discovered his error (s) and managed to correct it /them while the clay was still wet. Sometimes we can make out what underlies a deletion, or observe that a sign or two were added as an afterthought, after the surrounding words were complete. When a scribe runs out of space, as was often the case because the tablets were so small, he may squeeze a word above the line, continue over the right edge, and even go around to the back , as on tablet (PY Va 1324 ). As a rule the back is not inscribed, but can be used if the space on the front proves inadequate . But sometimes it looks as if the back was inscribed with a text un-related to the front; It is hard to see any correlation between the miscellaneous catalogue of jars, bowls and other vessels on the front of the tablet MYU 611 and the note of olives, figs and wines on the back – they could not be merely the containers. Each horizontal line counts for 10; so the total is 50. However because the tablet is truncated on the right side it could be there were more than 50. Lastly the incomplete condition of the archive that has come down to us presents us with many problems; but we have found means in some cases to overcome this deficiency, such as the discovery of ” supersyllabograms ” by Richard Vallance, my Linear B teacher,where we have two or more sets of tablets containing the same information….many of which are found on the tablets relating to military affairs which I am working on at the moment. It is on occasion relatively easy to use one tablet to supplement the gaps in another or others. NOTE: I have many Linear B tablets of the Military affairs to translate which during the next few months I will publish here on my blog. 35 million years of London’s geology is preserved 150 metres underground in a Cheshire salt mine. Take a look inside. THIS IS A MUST READ FOR ALL OF THOSE WHO ARE INTERESTED IN GEOLOGY. Fascinating !